Two arguments trip up anti-vaxers when they argue autism causation by vaccines. 1) Cuba History: Despite near-perfect vaccine compliance, including the MMR, there is very little autism in Cuba, though incidence rose to 1:2,500 as of 2015. International studies of vaccine adverse events also find very low incidence in Cuba. 2) Japan History: The MMR vaccine was cancelled circa 1992, when Japan suspected that the MMR might be causing autism, yet autism continued to rise. 1) Cuba: With trade barriers in place, Fidel Castro's Cuba could not afford to buy or maintain ultrasound machines, thus there has been (until more recently) virtually no autism in Cuba. During the last decade, ultrasound machines are being donated. Recently, as of 2016, trade barriers are falling and medical device sales reps are meeting high level officials in Cuba, preparing major campaigns. Expect autism incidence to skyrocket. Expect the epidemic to be described as "an ongoing epidemic only now recognized due to improved survelliance." 2) Japan: Circa 1992, Japan increased ultrasound machine allowed intensities by at least 8x-15x. 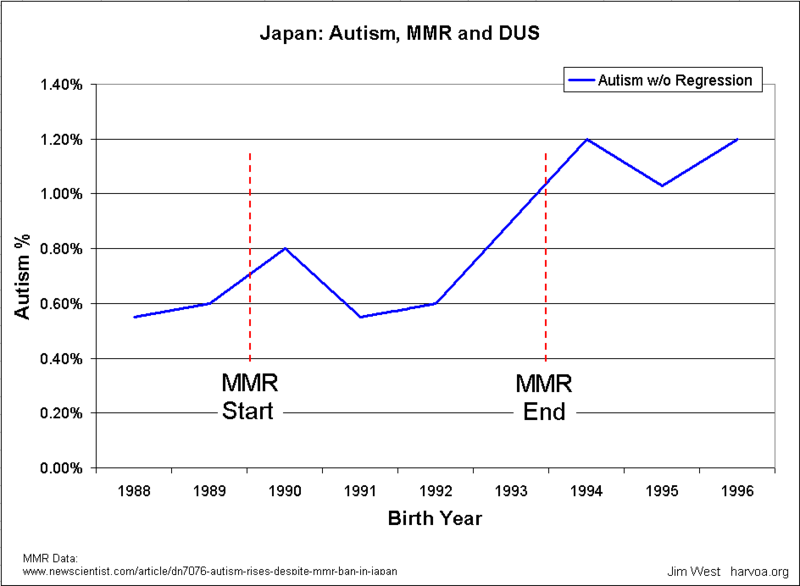 Autism increased though MMR was canceled. Japan raised ultrasound intensities following the FDA increase in 1991. • Any ultrasound clinical session permanently damages cells, hormones, and immune system to some however minute degree. This means that cells have less ability to handle subsequent poisoning (such as vaccines), thereby increasing the potential for ASD/etc. Additionally, ultrasound brings epidemics of rashes, allergies, GI tract dysfunction, personality defects, irrational screaming, etc. • Ultrasound is already used in medicine to “potentiate” and “enhance” the efficiency of antibiotics and other pharmaceuticals. That is done by a strategic destruction of the cellular immune system. Example: Prosthetic limbs often become infected and must be “sterilized” in vivo with ultrasound-potentiated antibiotics. It follows then, that ultrasound must also be potentiating antibiotic and vaccine damage. Medicos will argue that they use a much higher ultrasound dose for “potentiation” and that below their exposure levels, ultrasound is safe. However, numerous studies prove them wrong — nearly any clinical exposure is damaging to some degree (however minor or major) to the fetus. Several ultrasound studies show that the immune system is damaged. Newborns and young children appear often to be born into misery, e.g., GI tract dysfunction, irrational screaming, rashes, etc. Medicos are telling parents that postnatal problems are “normal” or the result of “immaturity” and that the child will outgrow the problems. I suspect that newborn Apgar tests are not being done or not being reported. The probability of a second trimester fetus surviving to birth is only 72% in the U.S., despite its expensive high-tech expertise. The probability of neurological damage diagnosed is approximately 14%. Viewing 14% through a distribution curve would expand those statistics those less affected and those undiagnosed and those in denial — to a much wider prevalence. Cuban history includes full vaccine compliance among the population and yet there is virtually no autism. The nonprofit organization Autism Speaks visited the autism clinic in Havana and spoke with leaders and staff. Autism Speaks theorizes that deficient survelliance may explain the lack of autism in Cuba. Such views, without ultrasound science, maintain the autism mystery and serve to move the autism industry into Cuba. Nevertheless, Autism Speaks relayed Cuba's insistence that it has very low autism incidence. Cuba has 10x more doctors per citizen than the United States. They have 99% vaccine compliance. Caesarians are common. With such an enthusiastic orthodox medical attitude, Cuba would certainly have found autism if it existed. With free medical for everyone, one would expect its Autism Therapy Center to be overflowing with overwhelmed mom's bringing their autistic children — if there was an autism epidemic. Autism Speaks visited the Autism Therapy Center in Havana, and witnessed the patient traffic without comment. Galindo (2012) studied "Vaccine-related adverse events in Cuban children". Serious adverse effects on the order of autism were nearly non-existent. In 9 years they found 8 severe adverse events with over 45 million doses administered. The Ultrasound Synergy Model simply resolves the contradictions as follows. There were few functional ultrasound machines in Cuba due to poverty. To explain the slight rise of autism from 2001, note that there have been ongoing donations of ultrasound devices to poor Cuba. Presently, as of 2016, with international trade opening up, salesmen are making high level connections in Cuba, and so, we can soon expect a tremendous rise in autism. When anti-vaccinationists argue vaccine causation for ASD, they can self-defeat with statistics. As an example, see Generation Rescue’s attempt to statistically argue for vaccine causation of ASD with its "Table 3". At first glance, and with its introductory text, it is compelling but strangely muddled. 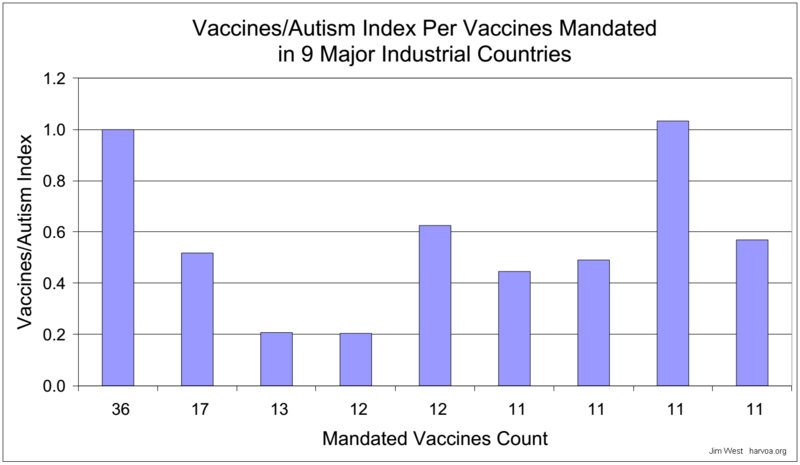 To make clarify their table, I graphed its data as ratios: Mandated vaccines count divided by ASD incidence. As can be seen, the pattern does not slope down towards the right; it does not indicate vaccine causation, as claimed. Less mandated vaccines even show more autism. Parents, e.g., the witnesses interviewed in the film Vaxxed, know from experience that vaccines are culpable, but vaccine statistics alone don’t support their observations. Ultrasound-vaccines-antibiotics statistics makes sense. 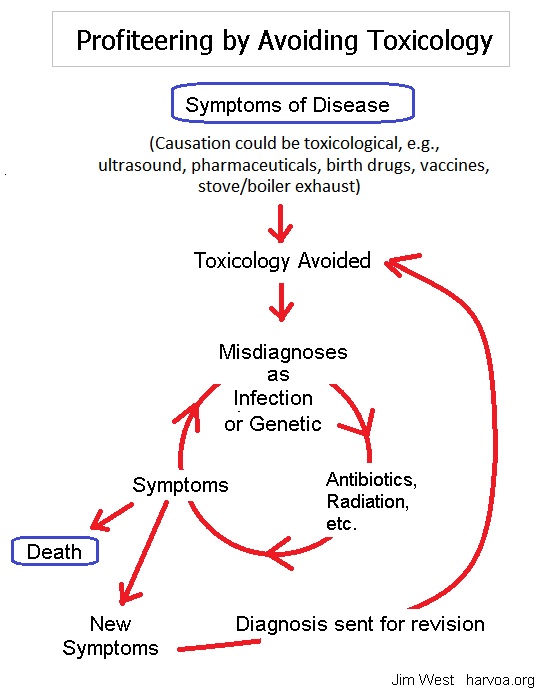 The Ultrasound Toxic Synergy Model supports parents who witness vaccine causation: More often they are actually witnessing a crisis of acute poisoning that is arising from vulnerabilities earlier initiated in the womb by ultrasound. Note this damning parallel: “Potentiation of drug delivery” is already an established medical procedure, utilized to circumvent the immune system by causing cell membrane dysfunction, termed “increased cell membrane permeability”. This allows toxic pharmaceuticals to be forced through otherwise impermeable cell membranes and into the cells. We can’t trust statistics. The CDC tweaks them. Studies are tweaked in ways that weaken vaccine criticism, however, by far the biggest tweak is the complete omission of the topic, Ultrasound Toxic Synergy. Parents and professionals (e.g., Vaxxed interviews) are witnessing damage following vaccines. Though they describe vaccine causation, their testimony when closely heard, reveals more than vaccines in the causation dynamic. Parents sometimes witness an immediate time correlation of vaccine=autism, but more often it appears they are actually witnessing a cycle of events related to vaccine reactions. They are, for example, witnessing antibiotic damage from medical intervention following vaccine reactions. Vaccine reactions have parents bringing children to doctors where more pharmaceuticals such as antibiotics are administered to the children. Such reactions would be much more likely if there was a prenatal initiation of vulnerabilities by ultrasound. 3) Ionel Rosenthal, Joe Z Sostaric, and Peter Riesz, “Sonodynamic Therapy — a Review of the Synergistic Effects of Drugs and Ultrasound”, Ultrasonics Sonochemistry 11, no. 6 (September 2004): 349–63, doi:10.1016/j.ultsonch.2004.03.004. 5) From my limited but very attentive layperson experience. 7) Galindo, Belkys M., Damarys Concepción, Miguel A. Galindo, Antonio Pérez, and Jesús Saiz. “Vaccine-Related Adverse Events in Cuban Children, 1999-2008.” MEDICC Review 14, no. 1 (January 2012): 38–43. Those seeking medical advice should consult medical professionals without delay. Consult trusted professionals to clarify and verify related issues. The author is not an authority. His research addresses apparent contradictions and is designed to cultivate discussion.